Daled Amos: Mideast Media Sampler 07/30/2013: Does Kerry Know Palestinians Were Supposed To Reject Terrorism 20 Years Ago? The Washington Post, at least acknowledged that this was a major concession on Netanyahu's part, but the troubling aspect in both cases is the parallelism that each sets up. In the New York Times, the language is "inflamed passions on both sides." In the Washington Post it is "Israeli public views / Palestinians see" equation. Only in describing something in the Middle East would two such different viewpoints be place side by side. No doubt that most Americans would have their "passions inflamed" by the early release of brutal murderers. Most Americans would "view" people who tried to kill a busload of children as a terrorist. These are views that need not be qualified. Similarly most Americans would find it appalling that anyone would excuse or celebrate such barbarity. This reporting isn't designed simply to tell a story, but to excuse the glorification of terrorist by the Palestinians. If that behavior isn't excused, the peace talks make no sense. How could one side trust the other, when the latter celebrates the killing of the former's citizens? The fact that Mahmoud Abbas recently eulogized a mass murderer as a "pure soul" or that the Palestinian Authority celebrated 61 acts of terror only underscores this point. These two media outlets instead of reporting the news, are excusing the behavior on one side. In the Washington Post the issue is framed like this As talks begin, Jewish settlements loom as challenge. Somehow, in this telling, the unreasonable Palestinian "right of return" is really nuanced. For someone who demands that no Israeli be in his territory after peace is concluded is the height of chutzpah for him to demand that Israel accept some number of Palestinians. And it's just as outrageous for journalists to pretend that there's anything reasonable about the demand. And if the Palestinians are compromising on the right of return what serious compromise will Israel make? Why, according to Birnbaum, it's Jerusalem. For a phony compromise on the right of return Israel must cede some portion of Judaism's holiest city. 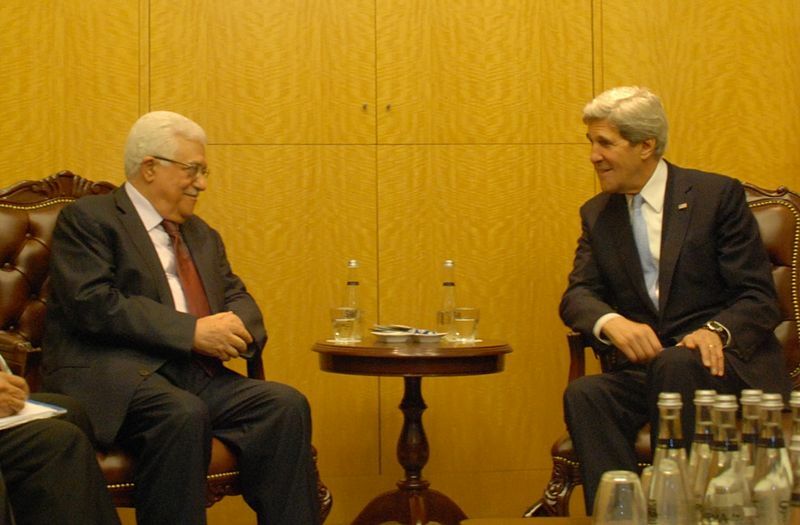 Seth Mandel critiques John Kerry's precondition demands on Israel. Barry Rubin notes that by validating the Palestinian efforts to internationalize the conflict, the administration reversed twenty years of precedent. Let's say Israel satisfies every single (ever changing) demand of the Palestinian Authority and its many cheerleaders, Israel still won't have peace. Technorati Tag: Israel and John Kerry and West Bank and Palestinian Terrorism.